In the applet below, note the equations displayed to the right of the graph. One equation is displayed in pink. The other equation is displayed in purple. The lines graphed, however, do not match the current equations given. Directions: 1) Move the pink points (of the pink line) to mark the correct y-intercept and one other point on that line using the slope. 2) Move the purple points (of the purple line) to mark the correct y-intercept and one other point on that line using the slope. 3) Look at where the lines intersect (touch). 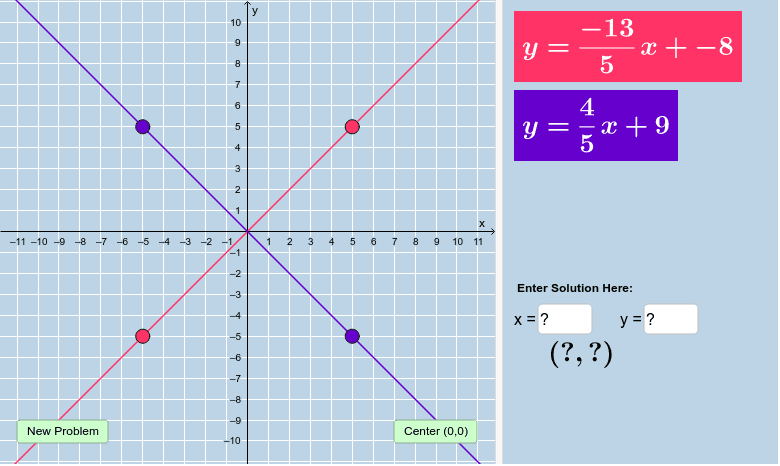 Type this point for the x and y coordinate into where it says "Enter Solution Here." 4) Click away on the applet when you enter the points. If it is correct, it will appear on the graph and you have solved the system! 5) Write your system and your answer on the note sheet. 6) Hit the new problem button to get a new problem. Repeat this process as many times as you need in order to master this concept!